Browns Shoes is a family-owned business established in Montreal in 1940, and is synonymous with top international designer collections and exclusive street savvy fashion for ladies, men and children. One of the secrets to the success of the chain is the retail philosophy of the late Chairman Morton Brownstein C.M., who explained, “I want every customer to say, ‘I need to go to Browns,’ not ‘I need to buy a pair of shoes.’ If we accomplish this, then we have succeeded in equating shoes with Browns in a customer’s mind, so that for her or him, the only place to purchase shoes is Browns.” A third generation now leads the business, and the company has expanded with each successive generation’s strengths. 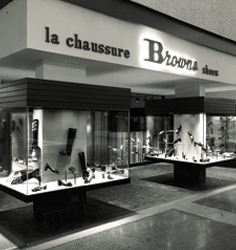 In 1940, Benjamin Brownstein opened a family shoe store on Ste-Catherine Street, the central shopping district of Montreal of that era, selling products in a wide range of prices. After a fire gutted the location in 1954, Morton Brownstein, who had taken over the business from his father, gave the company a new direction, focusing on exclusive designer and fashion footwear. In 1959, Morton Brownstein was the first North American retailer to travel to Italy and to bring Italian designer shoes to Canada. He worked directly with the legendary Salvatore Ferragamo at his original store on Via Tornabuoni in Florence, where Signor Ferragamo himself wrote the Browns’ order for shoes and handbags. Browns was the first Canadian retailer to carry Charles Jourdan, Bruno Magli, and Rossi Moda. Today, Morton’s son Michael Brownstein is the president of Browns, and has successfully expanded the chain to over 60 locations throughout Canada. He was the first retailer outside of Italy to win the prestigious Micam award for his fashion interpretation, his knowledge of craftsmanship and his success in promoting the Italian shoe industry. Michael has brought Browns to the forefront of the 21st century by creating a new chain of stores, B2, that focuses on the edgy, street fashion that appeals to a younger generation as well as to trend-conscious consumers. Michael has also continued the company’s tradition of creating personal relationships with the leading shoe designers of today, who provide Browns with many exclusive styles. Michael has always demonstrated his abilities to be a visionary in the Canadian retail market. This is why in 2011, Browns took the decision to invest heavily in a new state-of-the-art distribution centre, featuring a fully automated ‘intelligent’ distribution system which is comprised of 63 robots fulfilling store orders as well as e-commerce orders. At the time, the risk was high but today it not only brings benefits to Browns, but also ensures Browns’ success for many years. Browns recently celebrated its 75th anniversary as a thriving and growing, family-owned Canadian company, and marked the two year anniversary at its new, LEED head office building in Montreal, in addition to expanding retail operations to the East Coast market. 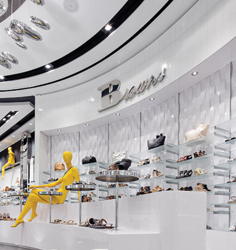 As North America’s leading independent footwear chain, Browns is embarking on a new phase of growth with a renewed commitment to elevating the shopping experience for their customers with innovative store design. The Browns’ buyers take great pride in showcasing the finest footwear and hottest trends from at home and abroad. The collections, both designer and house labels, are curated to appeal to the customer who is sophisticated, knows what she or he wants, and enjoys fashion.